For other uses, see Dancing Queen (disambiguation). "Dancing Queen" is a Europop song by the Swedish group ABBA, and the lead single from their fourth studio album, Arrival. It was written by Benny Andersson, Björn Ulvaeus and Stig Anderson. Andersson and Ulvaeus also produced the song. "Dancing Queen" was released as a single in Sweden on 15 August 1976, followed by a UK release and the rest of Europe a few days later. It was a worldwide hit. It became ABBA's only number one hit in the United States, and topped the charts in Australia, Canada, the Netherlands, Belgium, Ireland, Mexico, New Zealand, Norway, South Africa, Spain, Sweden, the United Kingdom, Germany and Zimbabwe. "Dancing Queen" also reached the top five in many other countries. Musically, "Dancing Queen" is a Europop version of American disco music. As disco music dominated the US charts, the group decided to follow the trend, replicating Phil Spector's Wall of Sound arrangements, actually engineered for ABBA by Michael B. Tretow, as the credited engineer on the album the song was first included on, Arrival. The song alternates between "languid yet seductive verses" and a "dramatic chorus that ascends to heart-tugging high notes." It features keyboard lines by Andersson, which accentuate the melody's sophistication and classical complexity, while Ulvaeus and Andersson interlace many instrumental hooks in and out of the mix. Anni-Frid Lyngstad and Agnetha Fältskog's layered vocals have been noted for their dynamism, "[negotiating] the melody's many turns flawlessly." Lyrically, the song concerns a visit to the discotheque, but approaches the subject from the joy of dancing itself. The music video on YouTube has over 320 million views as of February 2019, and has become ABBA's most recognisable and popular song. The recording sessions for "Dancing Queen" began on 4 August 1975. The demo was called "Boogaloo" and as the sessions progressed, Andersson and Ulvaeus found inspiration in the dance rhythm of George McCrae's "Rock Your Baby", as well as the drumming on Dr. John's 1972 album, Dr. John's Gumbo. The opening melody echoes "Sing My Way Home" by Delaney & Bonnie (from Motel Shot, 1971). Fältskog and Lyngstad recorded the vocals during sessions in September 1975, and the track was completed three months later. During the sessions, Benny Andersson brought a tape home with the backing track on it and played it to Anni-Frid Lyngstad, who apparently started crying when listening. Lyngstad said, "I found the song so beautiful. It's one of those songs that goes straight to your heart." Agnetha Fältskog later said: "It's often difficult to know what will be a hit. The exception was 'Dancing Queen.' We all knew it was going to be massive." While working on the lyrics, the first half of the second verse was scrapped: "Baby, baby, you're out of sight/hey, you're looking all right tonight/when you come to the party/listen to the guys/they've got the look in their eyes..." It survives in footage from a recording session. "Dancing Queen" premiered on German and Japanese TV during the spring of 1976. It saw its first live and domestic performance on 18 June 1976, televised on Swedish TV during an all-star gala staged by Kjerstin Dellert at the Royal Swedish Opera in honour of King Carl XVI Gustaf of Sweden and his bride-to-be, Silvia Sommerlath, who were married the next day. For their 1980 Spanish-language compilation-album Gracias Por La Música, ABBA recorded a Spanish version of "Dancing Queen", renamed "Reina Danzante", with Spanish lyrics provided by Buddy Mary McCluskey. The track was retitled "La Reina Del Baile" when included on the compilation album ABBA Oro: Grandes Éxitos in the 1990s. In 1993, in honour of Swedish Queen Silvia's 50th birthday, Anni-Frid Lyngstad was asked to perform "Dancing Queen" on stage, repeating ABBA's 1976 performance of the song at the pre-wedding gala for King Carl XVI Gustaf and Queen Silvia. Frida contacted The Real Group and together they did an a cappella version of the song on stage at the Royal Opera House in Stockholm, in front of the king and queen. The Swedish prime minister at the time, Ingvar Carlsson, was also in the audience that night and said it was an ingenious idea to perform "Dancing Queen" a cappella. The performance was recorded by Sweden's Television (SVT) and is included in the biographical documentary Frida – The DVD and The Real Group's 1994 compilation album Varför får man inte bara vara som man är. For the soundtrack of the 1994 Australian film Muriel's Wedding, songwriters Ulvaeus and Andersson allowed the use of "Dancing Queen" and other ABBA hits. "Dancing Queen" was among the ABBA songs included in Mamma Mia!, the jukebox musical first produced in 1999 and adapted in 2008 as movie: Mamma Mia!. It is also featured in the film's sequel, Mamma Mia! Here We Go Again. The first International Standard Musical Work Code was assigned in 1995 to "Dancing Queen"; the code is T-000.000.001-0. "Dancing Queen" was a worldwide hit, topping the charts in more than a dozen countries including ABBA's native Sweden (where it spent 14 weeks at the top), Australia, Belgium, Brazil, Canada, Germany, the United Kingdom, Ireland, Mexico, the Netherlands, New Zealand, Norway (where it charted for 32 weeks (VG-lista Top 10), making it the 11th best-performing single in that country), South Africa and Rhodesia. "Dancing Queen" also topped the charts in the United States, ABBA's only No. 1 on the Billboard Hot 100, and was a Top 5 hit in Austria, Finland, France and Switzerland. The song sold over three million copies. The track was the fourth biggest single of 1976 in the UK. According to Donald A. Guarisco of AllMusic, the track's "sincerity and sheer musicality have allowed it to outlast the disco boom and become a standard of dance-pop." The song's release also cemented ABBA as an international act and signified the beginning of the group's 'classic period', which would span the following four years. It has become a standard for dance divas like Carol Douglas and Kylie Minogue, and has been covered numerous times by acts including U2. The song has been adopted by the LGBT community and, according to Mojo magazine, remains one of the most ubiquitous "gay anthems". In the UK Singles Chart, "Dancing Queen" was the last of three consecutive chart-toppers for ABBA in 1976, following "Mamma Mia" and "Fernando" earlier in the year. The song was re-released in the UK in 1992, taking advantage of an ABBA revival sparked by the success of Erasure's Abba-esque EP. The re-issued "Dancing Queen" reached No. 16 in the UK in September 1992. In 2000, "Dancing Queen" came fourth in a Channel 4 television poll of "The 100 Best Number Ones". It was chosen as No. 148 on the Recording Industry Association of America's Songs of the Century list. It is ranked No. 174 on Rolling Stone's 2004 list of The 500 Greatest Songs of All Time, the only ABBA song on the list. That same year, it made VH1's 100 Greatest Dance Songs in Rock & Roll at No. 97. Also in 2000, editors of Rolling Stone with MTV compiled a list of the best 100 pop songs; "Dancing Queen" placed 12th among songs of the 1970s. On 9 November 2002, the results of a poll, "Top 50 Favourite UK #1's", was broadcast on Radio 2, celebrating the 50th anniversary of The Official UK Charts Company. 188,357 listeners voted and "Dancing Queen" came out at No. 8. On 5 December 2010, Britain's ITV broadcast the results of a poll to determine "The Nation's Favourite ABBA Song" in which "Dancing Queen" placed at No. 2. In 2009, the British performing rights group Phonographic Performance Limited celebrated its 75th anniversary by listing the 75 songs that have played most in Great Britain on the radio, in clubs and on jukeboxes. "Dancing Queen" was number eight on the list. Former US presidential candidate John McCain named "Dancing Queen" as his favourite song in a top-10 list submitted to Blender magazine in August 2008. In August 2012, listeners to the 1970s-themed UK radio station "Smooth 70s" voted "Dancing Queen" as their favourite hit of the decade. In October 2014, the musical instrument insurer Musicguard carried out a survey determining "Dancing Queen" to be the United Kingdom's favourite "floorfiller". Unlike its closest competitors, "Billie Jean" by Michael Jackson (No. 2) and "Twist and Shout" by The Beatles (No. 3), it turned out to be very popular throughout the nation whereas the other two were strong regional favourites. In 2015, "Dancing Queen" was inducted into the Recording Academy's Grammy Hall of Fame. In September 2016, The Guardian ran an article by Tim Jonze entitled "Why Abba's Dancing Queen is the best pop song ever". Jonze writes: "Dancing Queen is beautifully produced: catchy and euphoric, the perfect backdrop for a song that encapsulates the carefree bliss of youth". Several artists are cited as being influenced by the song, including Elvis Costello ("Oliver's Army"), MGMT ("Time to Pretend") and Chris Stein of Blondie ("Dreaming"). In 1993, Hong Kong singer Angela Pang covered this song in Cantonese. "Dancing Queen" is a single released by A-Teens, an ABBA tribute band from Sweden. It is the fourth and final single from their first album, The ABBA Generation. When the single came out in the spring of 2000, it peaked at number one in Mexico, becoming their first number one hit in that country. The song was also a smash hit in South America peaking at number three in Argentina, number five in Chile, number six in Colombia and number fifteen in Brazil. This was the main single for the United States promotion, when the album was released in March 2000. "Dancing Queen" reached ninety-five on the Billboard Hot 100, thirty-six on Airplay and number thirteen on the Hot Single Sales Chart. "Dancing Queen" was released as a double A-side with "The Name of the Game" in Europe, where both songs were promoted on radio simultaneously; Universal Music Group thought that "Dancing Queen", being the last single, needed a back-up to be successful. The video for "The Name of the Game" was an unofficial video, made especially for an A-Teens TV special in Sweden and it was never intended to be a promotional video. It was only aired by Channel 4. It appeared in the album Lizzie McGuire: Total Party!. Directed by Patrick Kiely, the video is set in a big high school. The video is a tribute to the movie The Breakfast Club, where band members (and extras serving as background dancers) are left in a classroom which transforms into a nightclub. Paul Gleason, the actor who played the assistant principal in the film, reprises the role for the video. It also appears in Night at the Museum: Secret of the Tomb. Naya Rivera and Amber Riley of the Glee cast performed the song in "Prom Queen". It charted on the Billboard Hot 100. U.K pop group 'Brotherhood of Man' also recorded the song. "Dancing Queen" was released on 13 July 2018 alongside the Mamma Mia! Here We Go Again soundtrack, by Capitol and Polydor Records. It was released on 21 July 2018 as the fourth single from the soundtrack. The song is performed by Pierce Brosnan, Christine Baranski, Julie Walters, Colin Firth, Stellan Skarsgård, Dominic Cooper and Amanda Seyfried and it was produced by Benny Andersson. ^ a b c d Sheridan, Simon (22 May 2012). The Complete Abba. Titan Books. ISBN 978-0857687241. Retrieved 18 December 2015. ^ Mansour, David (1 June 2005). From Abba to Zoom: A Pop Culture Encyclopedia of the Late 20th Century. Andrews McMeel Publishing. p. 108. ISBN 978-0740751189. Retrieved 18 December 2015. ^ a b c d Creswell, Toby (2005). 1001 Songs. Hardie Grant Books. p. 47. ISBN 978-1-74066-458-5. Retrieved 18 December 2015. ^ a b c d e f Guarisco, Donald A. "Dancing Queen – ABBA". AllMusic. Retrieved 18 December 2015. ^ "ABBA – Dancing Queen – The Missing Verse / Lost Lyrics" on YouTube. Retrieved on 15 November 2008. ^ "Royal Romance". 15 July 2011. Archived from the original on 2011. ^ "Sweden". Home.zipworld.com.au. Retrieved 27 March 2014. ^ a b c Roberts, David (2006). British Hit Singles & Albums (19th ed.). London: Guinness World Records Limited. pp. 330–1. ISBN 1-904994-10-5. ^ "BEST OF ALL TIME – SINGLES". VG-lista. Hung Medien. Retrieved 12 April 2012. ^ "United States of America". Home.zipworld.com.au. Retrieved 27 March 2014. ^ The Mojo Collection: The Ultimate Music Companion. Canongate. 18 February 2008. p. 371. ISBN 978-1847670205. Retrieved 18 December 2015. ^ "The RS 500 Greatest Songs of All Time". Rolling Stone. Retrieved 2 October 2018. ^ "The Pop 100: The Seventies". Superseventies.com. 18 June 1976. Retrieved 27 March 2014. ^ "The Top 75". 6 December 2010. Archived from the original on 2010. ^ "White House DJ Battle". Blender Magazine. Retrieved 4 August 2008. ^ "Smooth Radio presenters head to Smooth 70s". Radio Today. 22 August 2012. Retrieved 26 August 2012. ^ "Grammy Hall of Fame". 2015. Retrieved 4 November 2016. ^ "Why Abba's Dancing Queen is the best pop song ever". The Guardian. Retrieved 9 September 2016. ^ "Kent Music Report National Top 100 Singles, No 120". Kent Music Report. 11 October 1976. Archived from the original on 13 February 2008. Retrieved 12 April 2013. ^ "Item Display - RPM - Library and Archives Canada". Collectionscanada.gc.ca. 2 April 1977. Retrieved 23 February 2019. ^ "Image : RPM Weekly - Library and Archives Canada". Bac-lac.gc.ca. Retrieved 11 October 2016. ^ Billboard – Google Books. Books.google.ca. 9 October 1976. Retrieved 27 March 2014. ^ "Nederlandse Top 40 – week 36, 1976" (in Dutch). Dutch Top 40 Retrieved 31 December 2017. ^ "Dutchcharts.nl – ABBA – Dancing Queen" (in Dutch). Single Top 100. Retrieved 31 December 2017. ^ "Offiziellecharts.de – ABBA – Dancing Queen". GfK Entertainment Charts. Retrieved 13 February 2019. ^ "Top Selling Singles of 1976 | The Official New Zealand Music Chart". Nztop40.co.nz. 8 December 1963. Retrieved 11 October 2016. ^ "Top 20 Hit Singles of 1976". Retrieved 2 September 2018. ^ "Top 100 1976 - UK Music Charts". Uk-charts.top-source.info. Retrieved 11 October 2016. ^ "Item Display - RPM - Library and Archives Canada". Collectionscanada.gc.ca. Retrieved 11 October 2016. ^ "Top 100 Hits of 1977/Top 100 Songs of 1977". Musicoutfitters.com. Retrieved 11 October 2016. ^ Billboard, 24 December 1977. ^ "List of best-selling international singles in Japan". JP&KIYO. 2002. ^ Myers, Justin (23 June 2016). "EU referendum special: The biggest selling singles by European acts". Official Charts Company. Retrieved 23 June 2016. ^ "British single certifications – ABBA – Dancing Queen". British Phonographic Industry. Select singles in the Format field. Select Platinum in the Certification field. Type Dancing Queen in the "Search BPI Awards" field and then press Enter. 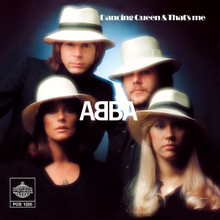 ^ "American single certifications – ABBA – Dancing Queen". Recording Industry Association of America. Retrieved 6 July 2012. If necessary, click Advanced, then click Format, then select Single, then click SEARCH. ^ "American single certifications – Abba". Recording Industry Association of America. If necessary, click Advanced, then click Format, then select Single, then click SEARCH. ^ "Official home and community – Upside Down charts". A-Teens.Com. 4 January 2001. Retrieved 27 March 2014. ^ Grein, Paul (18 May 2011). "Week Ending May 15, 2011. Songs: Idol Boosts Tyler". Chart Watch. Yahoo! Music. Yahoo!. Archived from the original on 28 May 2011. Retrieved 9 June 2011.